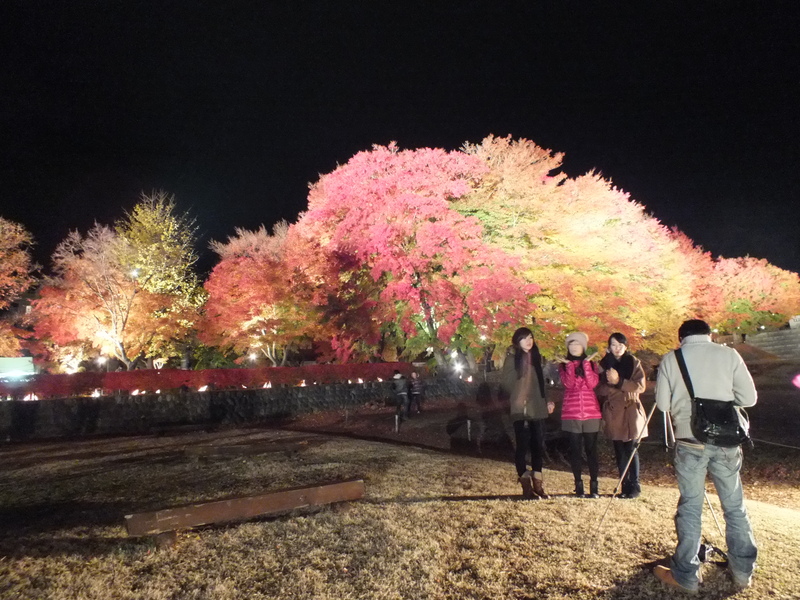 Most are familiar with hanami, cherry blossom viewing. But Japanese take pleasure in appreciating natural beauty of all kinds. 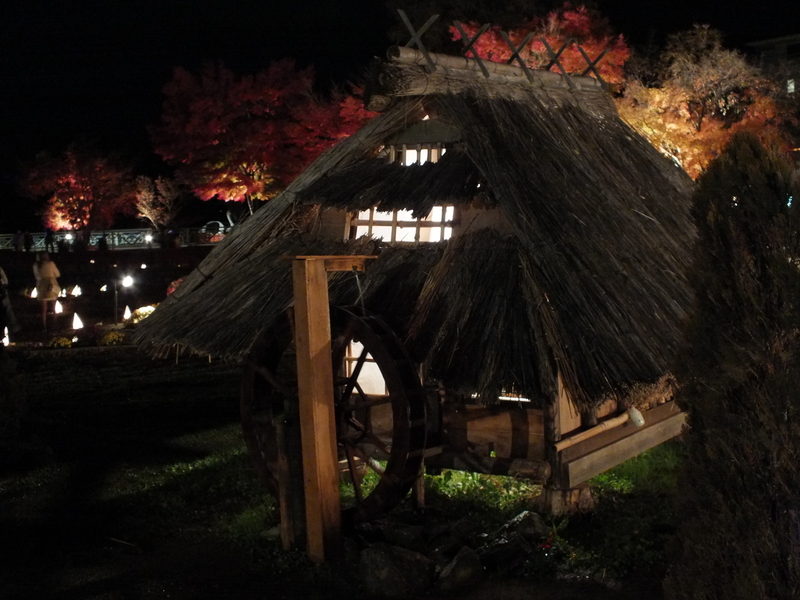 In old fashion houses–very old fashion houses–there’s a small shoji window in the tatami room that faces the garden. It’s quite low, and too small to let in much light. That’s because it’s not really a window, but more like a picture frame for the garden–there just to enjoy viewing it from the inside. So when Autumn rolls around it’s not to be wasted. A bit harder to find than hanami, kouyou matsuri (fall leaves festivals) are held throughout Japan when the leaves reach their peak color. Sometimes they’re called momiji matsuri too. (It means the same thing.) You should go to one. Now, normally I’d say a hike in the woods would have better fall leaves than any festival, but not when they’re lit up at night. That’s something different. The reds pop out and the yellows turn gold. 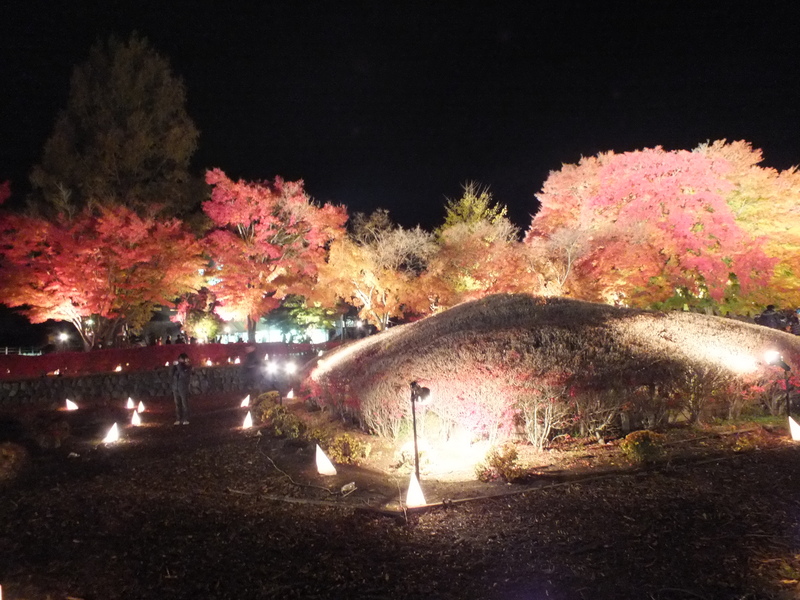 Oranges light on fire, and it all looks even better after a few cups of amazake (sweet, hot sake served at festivals.) The amazake definitely played a hand in my enjoyment of the fall leaves. It also helped warm me up. This kouyou matsuri was held near lake Kawaguchi, one of the five lakes of Mt. Fuji. The area gets quite cold, but I had just bought a new jacket that makes me look like a ninja turtle, so I was fine. She was a bit chilly though. A lot of people were taking pictures, and everyone wanted a shot from a certain hill. I wanted one too, but a group was taking so long to take theirs I gave up and took one with them in it. They were still shooting when I left, and also when I came back later to see if they were gone yet. 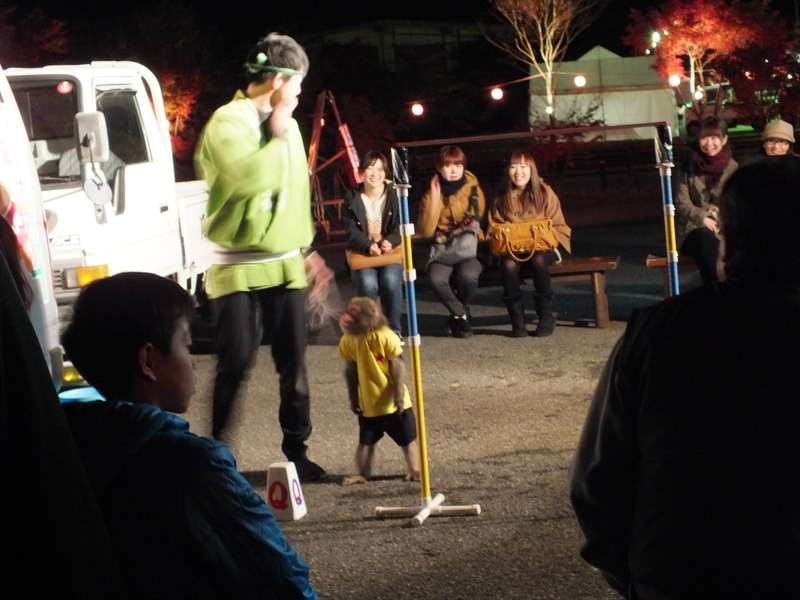 There was a performer with a monkey. I took some bad pictures. This monkey seemed happier than the other performing monkeys I’d seen, though I’m not entirely sure why I thought so. His last trick was jumping over that bar but the monkey didn’t quite make it, so the performer made it jump again after another round of collecting money. Good on him for turning failure into profit. This time the monkey jumped over the bar. They built some miniature old fashion houses that I didn’t understand and couldn’t appreciate, though she was mildly impressed. I preferred strolling among the trees, and we stopped in the middle of the bridge that connected the two halves of the festival and looked for a while. It all had a country fair atmosphere to it, but that wasn’t a bad thing. It felt staged but not polished enough to be artificial. 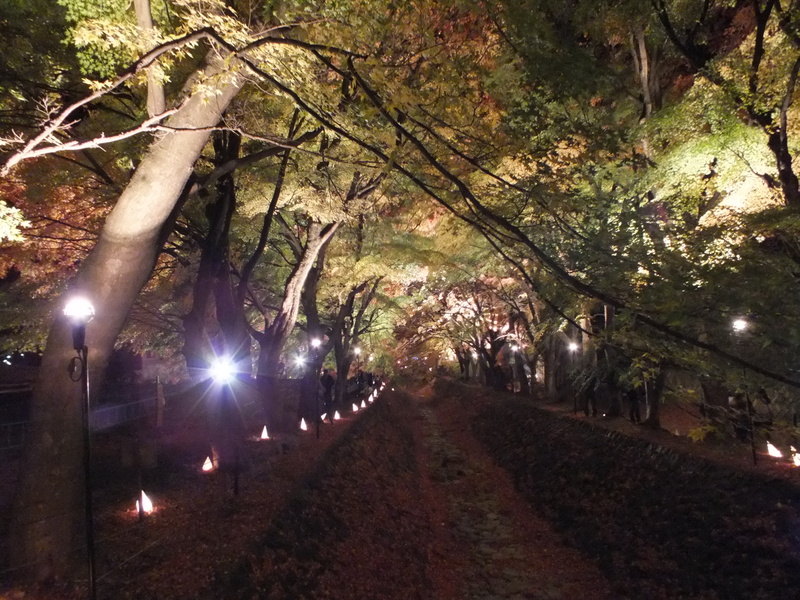 With the trees lit up and the softly glowing paper lanterns placed along the paths, it made for good kouyou viewing. I would go back again, and recommend a kouyou matsuri to anyone who happened to be in Japan in fall. Just bring a jacket if you happen to. It can get a bit cold. Follow me to get new posts by mail! Enter your email address to get my new posts by email! I really enjoyed the festival. It was quite relaxing. I would definitely check one out. It’s another wabisabi experience to add to your list. Copyright (c) 2013-2015 IntrovertJapan All Rights Reserved.